A long time ago, a religious Hindu text stated that a person who felt the call of nature should fire an arrow from their home. According to the "Vishnu Purana," the person could then safely defecate beyond the spot where the arrow fell to earth. Cultural beliefs are not always easy to change, but in a nation of 1.32 billion people, there are numerous drawbacks to following this advice. Today, there is a growing government campaign to eradicate open defecation in India by October 2, 2019 – known as "Swachh Bharat," or Clean India. For generations, for example, the people of the small village of Buliya Khedi would head for a nearby field or riverbank in search of a little privacy every time they needed to defecate. Even at night, in poor weather, or under the gaze of passers-by, there was no alternative. "It is troublesome to go out of the house with so many mosquitoes biting us," said Manjubai Patel, whose family makes up one of the 70 households in the village, located in the state of Madhya Pradesh. Patel's husband is a farmer and her two sons are studying. She helps out in the fields and the family invests everything they can spare in the boys' education. She admits that sometimes it can be difficult to make ends meet, "but somehow, we manage." In rural India, she admits, finding a private spot to defecate can be extremely difficult. "If we saw people, we would ask ourselves, 'How can we do this? They can see us!' And then we would have to hunt for another hidden place," Patel said. "But it is a necessity of life." As well as being uncomfortable and embarrassing, the need to defecate in the open can be dangerous. Human waste contaminates water sources and contributes to the spread of diseases, while Mrs Patel's brother-in-law died after being bitten by a cobra after leaving his house one evening. Defecating in the open also increases the risk of assault among women. An almost identical situation exists in thousands of small communities across rural India and the entire developing world, where poor sanitation causes losses estimated at billions of dollars every year through illness and reduced productivity. A study jointly produced in 2016 by LIXIL and Oxford Economics, and with the support of WaterAid, confirmed poor sanitation costs India approximately 5.2 percent of its annual GDP in 2015. The latest Joint Monitoring Programme report on drinking water, sanitation and hygiene by the World Health Organization (WHO) and the UN Children's Fund (UNICEF) estimates that 2.3 billion people around the world still do not have access to adequate sanitation. Of those, about 900 million people still defecate in the open. As a consequence, an estimated 800 children under the age of 5 die every day from diarrheal diseases caused by a lack of safe water and sanitary living conditions. In India, insanitary living conditions are also to blame for chronic stunting among children. There are over 48 million children in India who are stunted, more than in any other country in the world. LIXIL believes that situation can and should be remedied. And part of the answer is LIXIL's SATO business. SATO is a new brand of bathroom products dedicated to consumers in developing countries without access to modern plumbing and sewer infrastructure. SATO offers safe, affordable, and durable solutions for a more hygienic toilet experience. First developed in 2012 by American Standard, a LIXIL water technology brand, SATO toilets utilize an air-tight, counterweighted trap-door to minimize odors and the transmission of disease by blocking flying insects. Over 1.2 million units had been installed in over 15 countries, including Bangladesh, Haiti, Kenya and the Philippines, improving the lives of 6 million people so far. LIXIL has set a target of improving access to sanitation and hygiene for 100 million people by 2020. And India is a major part of that campaign, including the village of Buliya Khedi. There has been resistance from some who do not want to have a toilet close to their home, but showcasing the system in other households has quickly won over those with reservations. In Buliya Khedi, the campaign has been led by Dharmendra Piplode, the supervisor for the Aga Khan Rural Support Programme, a NGO working on rural empowerment. This includes the issue of sanitation. "I thought that every home in my village should also have a toilet, so I thought I first need to make one in my own house to show people," he said. "It wasn't difficult to convince people in this village, mainly because they've seen toilets in neighboring villages for two or three years." 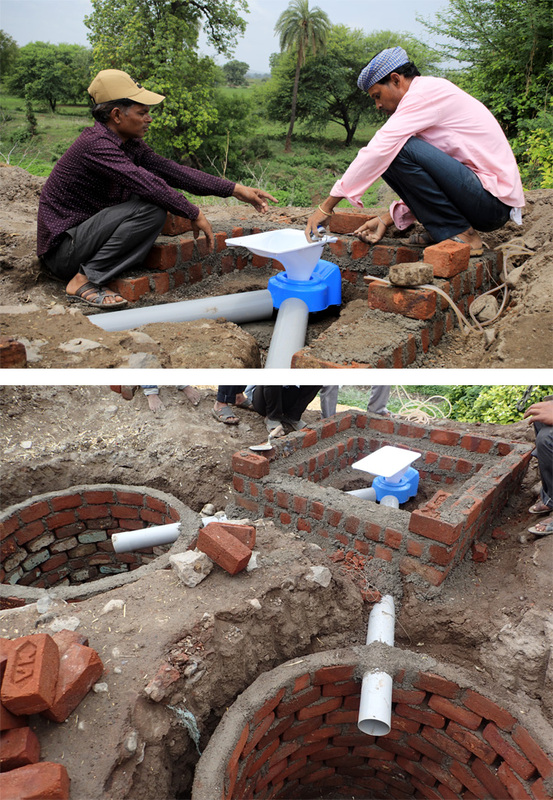 Many of the toilets being constructed are twin-pit systems, which are recommended by the Government of India. This system includes a toilet that is connected to a junction box that diverts the human waste into one of the two pits. Once one pit is full, the junction box is uncovered and the mason redirects the waste into the alternate pit. By the time the second pit fills up, the first lot of waste has composted and can be spread on farmers' fields as fertilizer. SATO toilets offer a significant leap forward from existing twin-pit latrines. The commonly used p-trap designs use five to six liters of water per flush, adding extra workload on women and children who are often responsible for collecting water. The innovative SATO V-Trap featuring a trap door design requires only 1 liter of water per flush, reducing water consumption by approximately 80%. Conventional brick and concrete junction boxes are also often poorly designed. They require significant amount of water to flush, and often clog. Switching the flow between the two pits is also time consuming and unhygienic. SATO's V trap system connects to straight pipes to minimize clogging, and lets users divert the flow between pits with a simple stick, meaning no-one gets dirty. The V-trap is compatible with all toilet pans – whether plastic or ceramic. "Our expertise in the design, manufacturing, distribution and marketing of bathroom products has aided us in creating SATO products," said Daigo Ishiyama, a designer of SATO products. "Innovation can play a major role in behavior change," he added. "With the Indian government's initiative, about 47,000 toilets are being built every day. The issue is not that there aren't any toilets, but rather that people return to their old habits of defecating in the open when the toilet clogs or doesn't work. Providing people with innovative products that really work and improve their lives is a good way to make sure behavior change sticks." Manjubai Patel is delighted with her new toilet. "I am sure that everyone is happy - but I know I am the happiest," she said. "Now we all live together and we try to manage with one toilet, but in the future ... we will need more. And so - if it is possible - we would prefer to have one more," she adds.